Description: In this basics class, the fundamentals of basic bead stringing AND basic wire-wrap techniques will be covered. Supplies, findings and tools will be discussed. 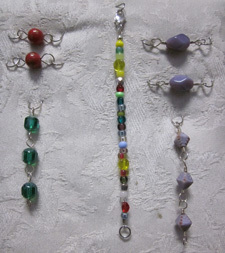 Learn the basics of stringing using various materials and how to work with wire combining it with chain. Make beads into necklaces, bracelets and earrings. By class end, students will know what is needed to create their next piece of personal art!